I think pretty much all seafood lovers will accept a shrimp, if offered. 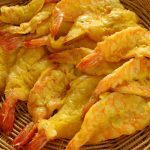 Korean cuisine has many recipes that use shrimp, and I love them all, but today I’m going to show you how to make shrimp pancakes (saeujeon: saeu means shrimp and jeon means pancake) from jumbo shrimp. Yes, I said jumbo shrimp! 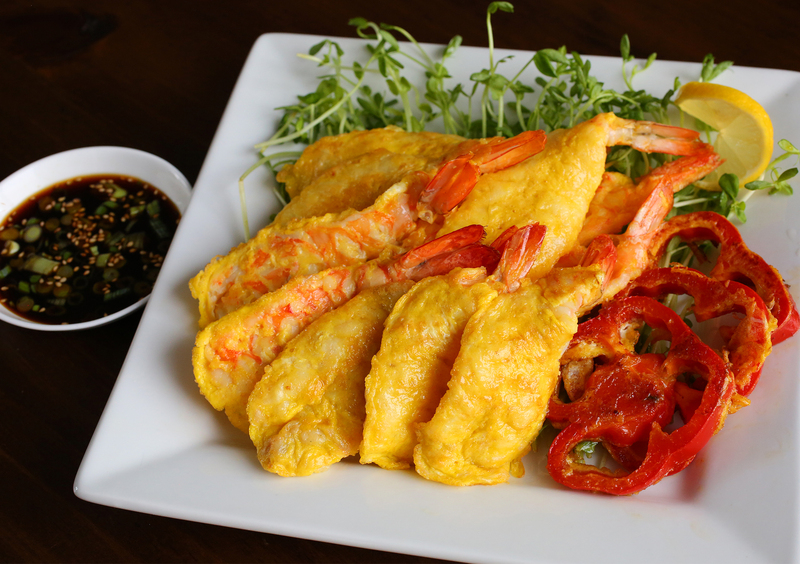 When you make saeujeon, you need to make them from jumbo shrimp, even though it’s more expensive. It will be worth it! Whenever you buy seafood, of course the first thing to do is check the freshness. 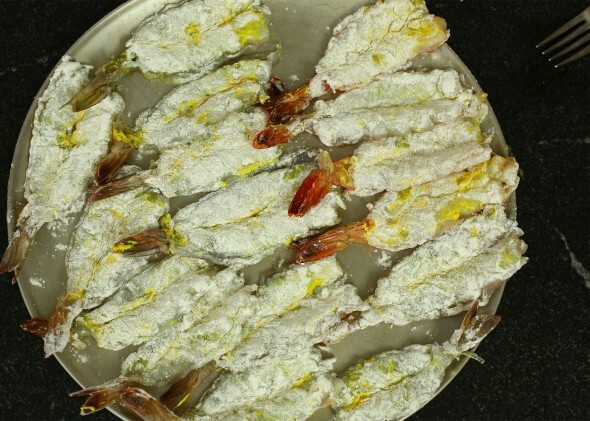 Shrimp is no exception, and even flash-frozen shrimp is better than old shrimp. How do you know if shrimp is fresh? First of all, it looks firm and shiny. Secondly, it won’t be smelly at all. It may smell like the ocean a bit – that’s a beautiful smell! – but it won’t be stinky. When shopping at the fish market, smell the shrimp as fast and indiscreetly as you can, otherwise no fishmonger will be happy to see a weird customer sniffing his shrimp. Yes, our body temperature is 37 degrees Celsius! Excess handling of seafood and shrimp can actually spoil it faster. Saeujeon tastes sweet and succulent and has a chewy texture. When cooked, the shrimp look gorgeous! Twist off the shrimp heads and peel off the shells with your hands. Save the heads for broth. Leave the tails on but remove the sharp thing right top of the tail (telson) by pushing it up. Koreans call it a “shrimp water pouch” because that spot has always a little amount of water. Put the cleaned shrimp on the cutting board. 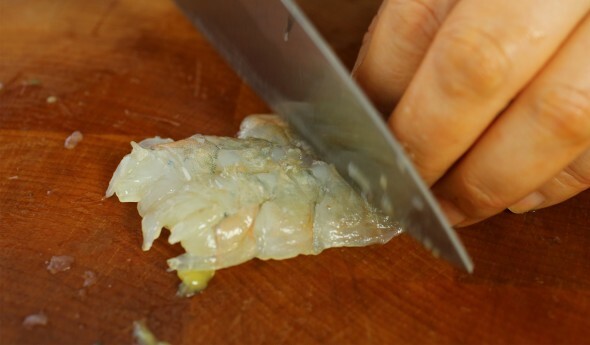 Remove the intestines of the shrimp by making a slit along the middle of each shrimp’s back. There will be a long dark line inside, pull it out by hand. Make a deeper cut to along the curve of the belly, but be sure not to cut all the way through. If you find any dark stuff near in there, remove it, too. Score the shrimp on both sides so that it won’t shrink when cooked. Rinse in cold water, drain, and pat dry with a paper towel. Combine soy sauce, vinegar, chopped green onion, and sesame seeds in a small bowl and mix well. Set aside. Mix the mustard powder with water in a small bowl. Put the shrimp on a large plate, belly side up and side by side without touching each other. Sprinkle 2 pinches of salt and ½ teaspoon ground white pepper over top, evenly. 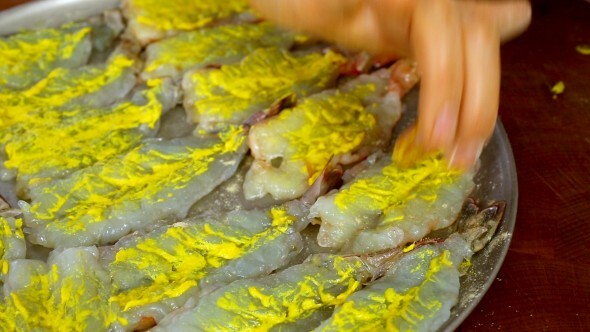 Dip your finger into the mustard paste and put a bit on each shrimp, just like painting. Beat 2 eggs with a pinch of salt in a bowl. Heat up a pan over medium heat. Add some cooking oil to the pan. Dip the shrimp into the egg and put the shrimp in the pan, coated part down. Repeat this with the rest of the shrimp but don’t crowd them in the pan. Cook for a few minutes until the bottom of the shrimp turns a little light golden brown, pressing down slightly with a spatula every now and then. Turn them over and cook another couple of minutes until both sides are light golden brown. Remove from the heat and serve as a side dish or snack with the dipping sauce. 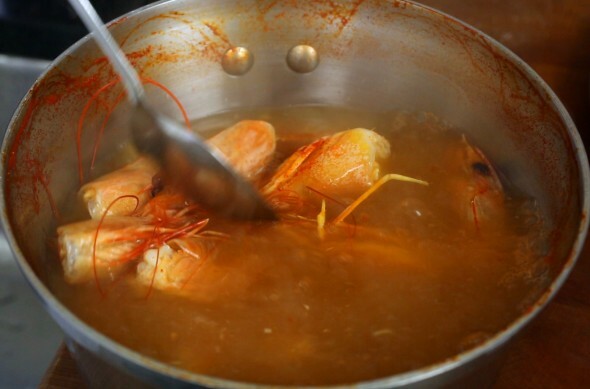 Shrimp heads are full of flavor, and a broth made from them is a great substitute for water in any Korean stew (but especially doenjang-jjigae), or to substitute the water you use in the porridge for kimchi. It always turns out delicious. Collect the shrimp heads and wash a couple of times. Put them into a pot and submerge them in fresh water, enough to cover them completely with an inch left over. Boil over low heat for 20 to 30 minutes until all the delicious stuff is infused into the water. Strain (or squeeze) before using. Posted on Wednesday, June 10th, 2015 at 7:35 pm. Posted September 19th, 2018 at 11:25 am | Log in to reply. Looks delicious Maangchi! I will try to make this with rice flour or cornstarch as I cook for someone who cannot eat wheat flour. Any suggestions welcome! Posted October 22nd, 2017 at 5:31 am | Log in to reply. I am very impressed about your cooking, especially Seafoods, Pancakes and Permented veggies like Kimchi, actually I love them all your recipes… I very Proud of you! Can I have a favor to ask, because I really Loved Korean foods and TV intertainment and dramas, how about if you give as Korean to English name your menus or recipes. 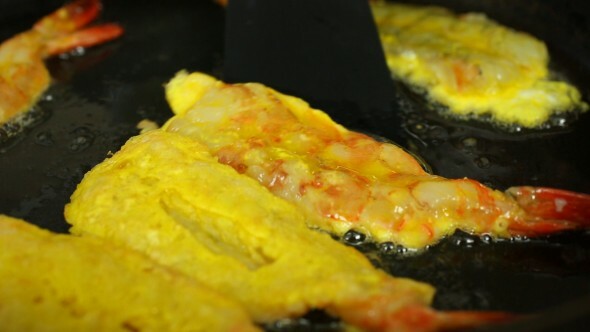 Just like Saeo- Shrimp, jeon- pancake, Wow…next time I will a picture the one I will cook from your recipes. Thank you so mam Maangchi and God bless you more. Posted January 14th, 2017 at 11:19 am | Log in to reply. I have a question too. 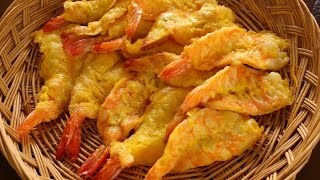 Can I use smaller shrimps and just make them like a batter to stick together and make the pancakes for this recipe? Would it still work? Or does it have to be bigger ones? Posted January 19th, 2017 at 10:30 am | Log in to reply. Yes, you can make delicious shrimp pancakes with small shrimp. Chop them up and mix with batter. Posted January 19th, 2017 at 2:43 pm | Log in to reply. Posted June 24th, 2015 at 12:31 pm | Log in to reply. Started following your channel since last year and I love your videos a lot! Your video has been a great inspiration for me to cook and taste Korea food especially for people living in other countries where it hard to find nice Korean food. But with your video, I can recreate them easily at home. I tried making Korean food for my parents and friends and they really like it! Now I am constantly cooking dinner for my parents with some of your recipe!!! And I thought I couldn’t get your cooking book in Singapore! But luckily I found them and it was the last piece. I know they are going to stock up the book, but I have to get them asap because I couldn’t wait any longer! Posted June 24th, 2015 at 9:51 pm | Log in to reply. I’m happy to hear that you found the book in Singapore! “with your video, I can recreate them easily at home…” You must be a great cook! Posted June 19th, 2015 at 1:34 pm | Log in to reply. Hi, i was just wondering where you got that basket from? ive been looking for one for vegetables and i havent been able to find one. Posted June 21st, 2015 at 12:52 am | Log in to reply. oh, you like the basket! I bought it in a market in Korea. Check out a large Korean grocery store, please. You may find one. Posted June 14th, 2015 at 9:04 am | Log in to reply. You did it again, another great recipe! I just finished eating this and I can only say: fabulous. I made this with regular mustard powder (becasue thats all I ihad) and I wish I had more shrimps. It tasted so great. And it is so easy and fast to make. I just have to practise the butterfly cut :-). 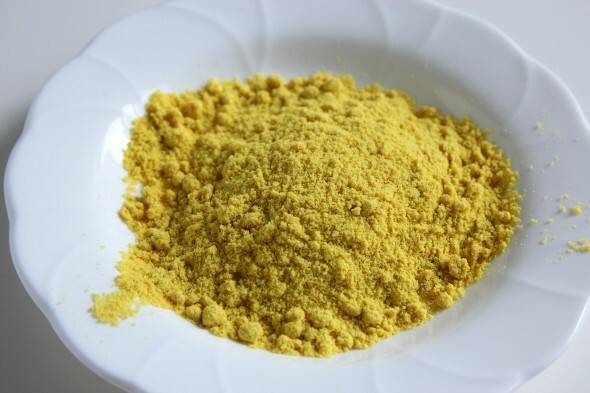 Is there is a difference between Korean and regular mustard powder? Posted June 18th, 2015 at 6:11 pm | Log in to reply. Yours looks fabulous! Yes, Korean mustard powder gives it a tingling spicy feeling, more than usual mustard. Posted June 13th, 2015 at 9:59 am | Log in to reply. Hi Maangchi! I am living in Seoul now, and at this season there are so many stands selling cases and cases of 매실. Could you post a recipe of making 매실주 and 매실 extract? I now can only buy made ones from the traditional market. Thank you! Posted June 11th, 2015 at 5:01 pm | Log in to reply. OMG these look out of this world! I must try it!!! Posted June 10th, 2015 at 11:37 pm | Log in to reply. Hi, it’s my first time to meet you online. I met your food online a few days ago and I got to love your cooking. After that time, i watch your videos every single day. I like your recipe and would like to follow all your way. Where did you buy your cutting board, I love it , so I want to buy one like yours as much as I can. Posted June 11th, 2015 at 2:11 pm | Log in to reply. Hi, Nice meeting you here on my website! I have several cutting boards but 3 of them (thick ones) are from Brooklyn Butcher Blocks. Posted June 10th, 2015 at 11:28 pm | Log in to reply. Posted June 11th, 2015 at 2:13 pm | Log in to reply. Let me know how it turns out. One tip is to use heirloom eggs with dark yellow egg yolks. Posted June 12th, 2015 at 4:49 pm | Log in to reply. This recipe was originally posted on June 10, 2015 at 7:35 pm by Maangchi. The video was watched 1,485,684 times on YouTube & has 20,126 likes!